Aquatunes Waterproof Headphones, Best MP3 Headphones . Best design for staying in ears. The original comfortable waterproof headphones that fit standard MP3 player audio jacks & cases. Waterproof speakers designed for complete submersion. Amongst our best MP3 headphones for value for money. Compatible with standard 3.5mm audio jacks e.g. Overboard & Aquapac cases (not compatible H2O Audio cases). The Aquatunes earplug system secures the speaker in ears of all different sizes and keeps water out. Aquatunes earphones are the original patented waterproof headphones designed for the lap swimmer, windsurfer, snorkeler or any other watersports enthusiast who enjoys listening to music in the water. 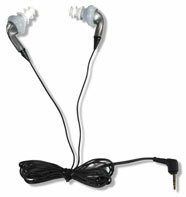 Below is a video review of four brands of wateproof headphones we sell. I compare the different styles of common earbuds available i.e. mushroom cup or christmas tree barb, to find which is the best one for staying put in the ear canal when swimming.